While I would call myself more of a honey enthiusiast than a beekeeper, one of my first motivations for becoming involved with bees was an interest in the different flavours and textures of honey created by varying feeding habitats. For example, I once sampled a honey in Berlin that was, quite appropriately to my mind, named Linden Honig. The bees had fed from lime trees, a sticky tree I now know to be a great favourite amongst bees as I can observe one in my neighbour's garden. T he honey was light, fresh and fragrant, quite unlike anything I had tasted before. Later, I tried a rich, dark, treacly honey produced by Mallorcan bees who had fed from carob trees. While any honey is welcome, I very much prefer something with a woodland bouquet, which is why beekeeping at Carlshead is so interesting to me. I kept my first hive in an orchard here at Carlshead Farms. The thought of bees feasting on apple blossom was a romantic one, but as they will happily fly a distance of two miles, I also knew they were taking in hedgerows, gardens, and almost certainly the willow trees that produce pollen as early as February, providing a wonderful and convenient hibernation-breaking feast. When anything happens in your family, it is said that you should tell the bees. As I had been pregnant throughout my beekeeping training, it probably came as no surprise to my bees when I told them a baby had been born. At first I carried on visiting my (now two) hives, but soon the joys of motherhood tempted me away. I know I'll return to it one day. Luckily, into my boots stepped local beekeeper Peter Reasbeck. Peter has many years bee-keeping experience, and was able to keep an eye on my hives while tending to his own, too, which were placed on a different part of the farm, next to a fledgling arboretum. Peter began teaching bee-keeping to the young people involved in the care-farming side of our business, and it wasn't long before my husband decided to join in, too. Peter and Gareth now run the bee-keeping on the farm, and diligently keep me supplied with abundant jars of delicious honey. Gareth and Peter have brought about a significant change in the way we keep bees here in the last year and a half. Initially placing one hive in a clearing in one of the woodlands on the farm, they discovered that the bees thrived in this location, and placed subsequent hives there. Now Peter has decided to move his hives from the arboretum this winter as the trees have started to provide too much shade and he is convinced that production has been far better in our woodland apiary. Wherever one keeps bees, there are basic rules, although these will generally have a degree of flexibility to them. Firstly, bees need shelter, or more accurately, a windbreak. In a garden or orchard this could take the form of a hedge or a shed. Secondly, they need optimum sunlight in order for the hive to warm up. A beehive needs to maintain a consistent temperature of 33 degrees Celcius. If the hive is not warm enough, the bees will stay in it, trying to keep it warm. Therefore, with any woodland bee-keeping, a clearing is essential. Hives will not thrive in heavily wooded areas. The third essential is water - be it a trough, pond, or nearby stream or river. As I've said before, bees will fly up to two miles, so water doesn't need to be right next to the hive, but the closer the better. We've also found that an essential for woodland beekeeping is a stand for the hives. This keeps them safe from curious woodland creatures, particularly scavenging badgers. One could also create a fenced area for hives, if necessary. Peter and Gareth, who both suffer from bad backs also find that the platforms mean less bending and the work is therefore more comfortable. Beekeeping is an art, as well as a science, and for a really comprehensive introduction, contact your local beekeeping association and take part in an introductory course. Local beekeeping associations can be found via the British Beekeepers Association website (www.britishbee.org.uk ), as can a useful downloadable guide to starting beekeeping. Beekeeping supplies can be obtained from Thornes, (www.thorne.co.uk) or often second hand via a local beekeeping association. Thanks for the insider information. As a beekeeper it is very important to joint your local beekeeping association, this will help you grow and be a successful beekeeper. 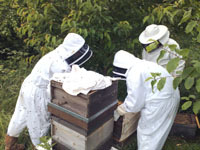 Bee-keeping can be as ‘hands on’ or ‘hands off’ as you like, depending on your circumstances. If you have a remote woodland with infrequent visits it is still possible to have one or more colonies on site. The harvest could be a bit hit or miss and you need to choose a strain of bee not prone to swarm. It would also be a good idea to place a few simple ‘bait’ hives on the property in the hope of capturing any swarm. I know a ‘keeper that takes several hives over to Northern Ireland each Spring and brings them back in the Autumn with no contact in-between. He always has some honey to harvest. That is one of the (many) great things about beekeeping. Bees feeding on different sources of nectar will produce totally different flavours of honey – the range really is incredible. If you keep bees in your garden, the flavour will be different from year to year as well, depending on the season and which plants do best that year. Great article. I started beekeeping this year and was very fortunate to get a good crop of honey from Lime trees. Delicious. My local beekeeping association have been fantastic source of training and support and I would urge anyone planning to keep bees in their woodland to join up. You won’t regret it. Thanks for this article, I already keep bees on the allotment and at home on the extention roof but I am due to start using the south side of a wood next spring so this article has been very informative for me.